Photo: Direccion de Prensa, Presidencia de la Republica de Chile. 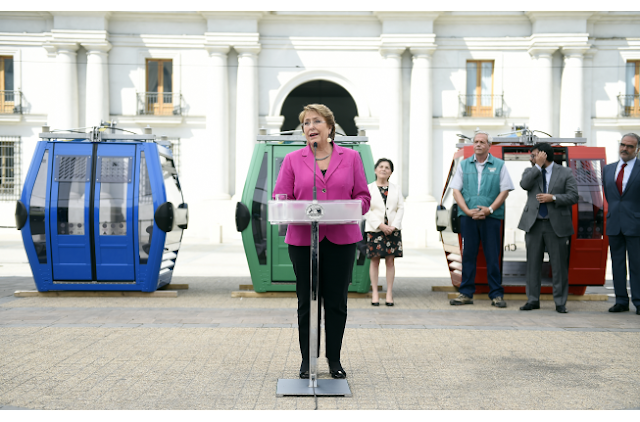 From the "Plaza de la Constitucion", in front of Palacio de La Moneda and with the presence of President Michelle Bachelet and the Minister of Housing and Urban Development Paulina Saball, Parque Metropolitano presented the new cabins that will have the new Santiago's Cable Car situated at Metropolitan Park. According to the words of President Bachelet, the system will begin to operate during the second half of 2016, Mrs. Bachelet highlighted the improvements that this means of tourist transport will have over the old system that operated between 1980 and 2009, (popularly known as "little eggs"). The arrival of the cabins is the last stage of a great work that lasted years and which meant a significant investment of nearly US$ 14 million since among other improvements, the new cableway as well as its stations will be adapted to receive disabled or handicapped persons and will also have a system for transporting bicycles, for those who want to pedal on the hill. The plan also includes increasing from 12 to 14 the towers supporting the system to move 46 cabins, besides the replacement of all the old wiring and modernize it. 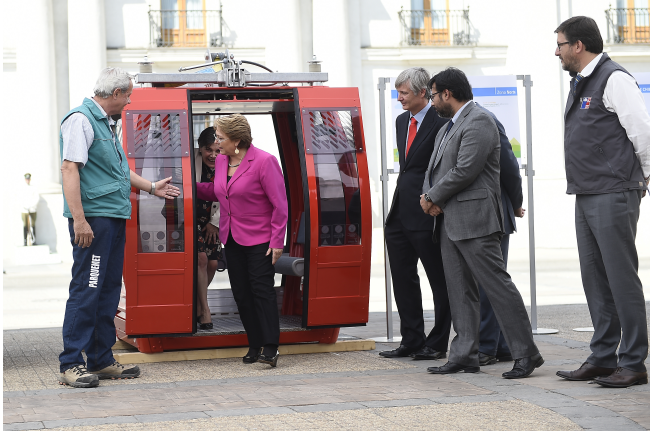 The new system can carry up to a thousand people per hour, which is an important number to facilitate access to this green area of the Chilean capital. The route will cover 4.8 kilometers, with 46 cabins in red, green and blue, for six people each, which will move through high voltage cables supported by 14 towers, divided into three Stations within the Metropolitan Park: Oasis, at the foot of Cerro San Cristobal (San Cristobal Hill) by the sector of Pedro de Valdivia; San Cristobal in the middle area of the route and Cumbre Station on top. Finally the president said that "the new infrastructure will recover all its charm with a more modern and safer system so that, the elderly, more children and families can take advantage of this huge park which is certainly one of the great attractions of Santiago".